I just put my big fat Cuban Turkey in the oven and blogged about it over on the Title Wave blog. I wish everyone a peaceful and happy Thanksgiving! I blogged over at Title Wave this morning (very early this morning). Go check it out. I had an opportunity to ask the current American Title 5 contestants a question and got some interesting answers! 2. Keep the people I love healthy, safe and happy. 3. That my books become wildly successful. 4. That the Noles win another football championship under Bobby Bowden. 5. And that I one day, organize all the closets in my house. I can't believe it's already time to cover conference my 2nd book. My editor contacted me last week and asked what I envisioned on the cover. I always feel so un-artistic at times like this. I swear, I'm a totally left-brained person (I'm not even sure how I manage to write fiction). So I had to call Mel and ask her opinion (Louisa was on the eve of deadline, otherwise she'd have gotten a call too) and she gave me a few things to pass along. Otherwise, I think I might have been blank. I'll just have to trust the folks at Berkley to come up with something fantastic. Georgia Meyer needs some time to think—and what better place to get her head on straight than Whispering Bay, Florida, in the company of her sister Frida and her sister’s Bunco friends, better known as the Bunco Babes? Georgia’s boyfriend—and boss—Spencer Moody made a slight miscalculation in the romance department and gave her a calculator instead of an engagement ring. So she needs some sisterly advice, in between rolling dice and drinking frozen margaritas, as to her next move. While considering subtracting Spencer, Georgia meets the very handsome Dave Hernandez. Unfortunately when a Bunco night gets a little out of hand, Georgia reveals more of herself to Dave than she intended. 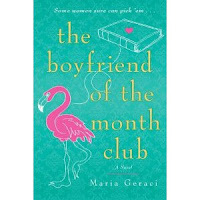 Now, as she helps the Babes prepare for a Bunco Black Tie fundraiser, she needs to search her heart—and keep her shirt on—long enough to decide if a love affair with Dave might be a dream come true or just a flash in the pan. Mel found my first book Bunco Babes Tell All available for purchase on Amazon last week. She called just as Crystal put the color on my hair. There I was, pacing around Red Hots (my hair salon) with my hair sticking up on end, hyperventilating. It's a pretty awesome feeling. Of course, it's early and the cover isn't up on the site yet, but this means people can start ordering my book! It's no secret I love old movies. But somehow, I've always managed to miss The Lady Eve. It's been on my netflix list forever, but kept getting bumped down for something else. I finally watched it last night. I might have to watch it again tonight. That's how much I enjoyed it. There was so much terrific dialogue and I know I missed half of it because I was laughing so hard. Plus I had garlic in one of my ears, so my hearing was a little under par. Let me back up a day. I went to bed Thursday with a mild sore throat and woke up Friday morning with an earache. My mother-in-law swears that sticking a piece of warm garlic in your ear helps cure earaches. By Friday night I was miserable. I thought, why not? I warmed up the garlic, stuck it in my ear, and curled up to watch T.V. 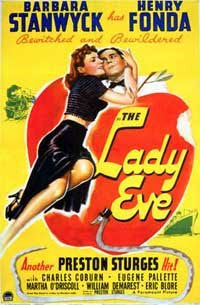 The instant I saw "The Lady Eve" pop up on my list of Free Movies On Demand, I clicked it. Let me tell you, they just don't write dialogue like that anymore. The plot is deliciously simple: Card shark/con artist Barbara Stanwyck tries to scam bumbling/handsome/naive millionaire Henry Fonda. Of course they fall in love. But the ending isn't exactly typical. 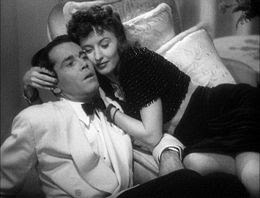 Watching Barbara Stanwyck outwit/outsmart/outplay Henry Fonda is like eating chocolate cake. And the fact that I woke up this morning without my earache is the whipped cream on top of it. I sent off my finished manuscript Bunco Babes Gone Wild to NY last Monday. Now I've got my fingers crossed and hope my editor loves it as much as I do. I know they'll be revisions, but I really think the story is all there. Of course, all the crunch writing I've done the past 2 weeks have left me exhausted. My throat aches and my ear feels funny. I don't do sick very well (don't have the time, either). I'm hoping a good night's sleep will fix all that. Ever the optimist, I am. Oh, and for any writers out there wondering if they should book signings, go check out Gerri Russell's great booksigning tips right HERE. With my first book coming out next May, I've already been stressing a little about this. She makes it sound so easy! I'm sure it's not, but as usual, her advice is fantastic.